When you first start your business and are working with a small crew, you are operating on adrenaline and are involved with every aspect of the company. But as your team grows, you begin to lose control of the day to day. It becomes more difficult to communicate with so many people, and it’s challenging to keep track of where you stand on projects. To deal with the increased workload, you work harder and longer, but you’re only becoming less efficient and more exhausted. You’re not operating as the kind of leader your business and your employees deserve. Your business and employees deserve a visionary leader. 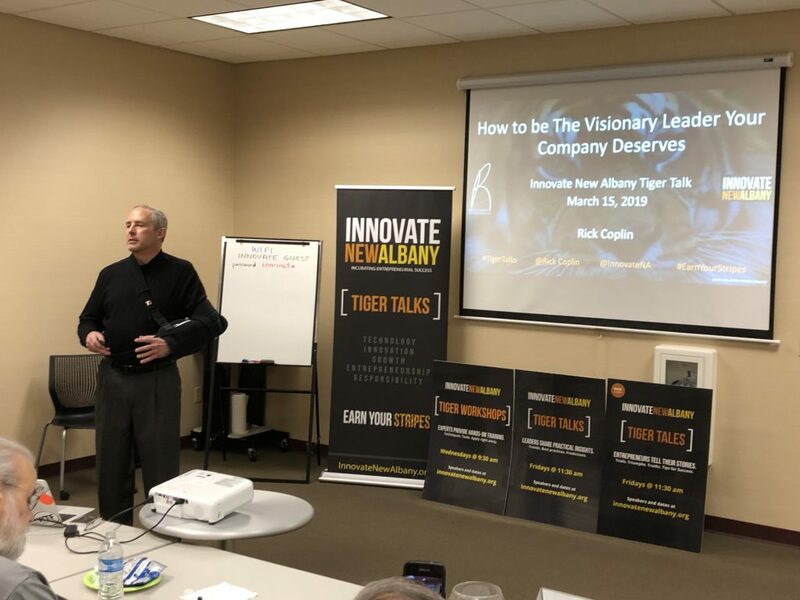 Rick Coplin, CEO of Rick Coplin International, presented “How to Be the Visionary Leader Your Business Deserves” at Innovate New Albany’s TIGER Talk on March 15. TIGER Talks are held free of charge throughout the month and focus on the topics of technology, innovation, growth, entrepreneurship, and responsibility. Rick said that a visionary leader is someone who has a dream, has seen the future in a different way than everyone else, and pursues it. Vision drives everything you do. A visionary leader can bring internal and external factors into focus to identify processes, systems, and culture. If you’re not careful, the culture of your company can quickly get out of hand once you start hiring people. It is up to you to set your company’s culture and communicate your expectations to your employees. They will be looking to you to set the example of your company’s values. It’s the visionary leader’s responsibility to help your employees understand their jobs and perform them efficiently. If an employee is not performing, you will need to communicate your expectations, show them how to do it correctly, and support them with feedback as they learn. Modeling takes time, but it’s important. You are like the center lineman of a football team. You must clear away the obstacles that threaten to tackle your employees, so they can do their jobs. Every day, you will have 100 things to do and only time to do two of them. Be confident on how you make decisions and know what is important. You’ll need to get comfortable with ambiguity. You won’t have everything you need to make the decision before you have to make it. So make the best decision you can with the facts you have and move on with confidence. The visionary leader sets the internal systems and processes in motion, but your team should figure out the details. They are closer to most situations than you are anyway, and they can take your business to the next level. Assess, mitigate and anticipate risk. Make a move with purpose. As the leader, you are setting how the company will be profitable. Be the architect and build and design your financial goals. Determine how the world will be different because of how you exist. You will spend most of your time communicating informally throughout the day or formally in meetings. If you communicate your systems and vision well, things will start to click. Truth be told, the leader or CEO is usually the first broken link in any problem. If you can acknowledge and fix this, you can fix any problem in your business. Part of being a visionary leader is honestly assessing where you fall on the CEO – employee continuum. Take a good hard look at how you spend your day. There are probably tasks you should delegate and tasks you should stop doing altogether. Most leaders need to focus on the things they think they SHOULD be doing that will give them the outcome they want. If you can do this as a leader, you will be visionary and your business will succeed. If you would like to learn more about becoming a visionary leader, visit Rick’s website.